To set a cursor shape use QCursor::setShape() or use the QCursor constructor which takes the shape as argument, or you can use one of the predefined cursors defined in the CursorShape enum. See also QWidget, GUI Design Handbook: Cursors, Widget Appearance and Style, and Implicitly and Explicitly Shared Classes. See CursorShape for a list of shapes. B=1 and M=0 gives an undefined result. Use the global Qt color color0 to draw 0-pixels and color1 to draw 1-pixels in the bitmaps. Valid cursor sizes depend on the display hardware (or the underlying window system). We recommend using 32x32 cursors, because this size is supported on all platforms. Some platforms also support 16x16, 48x48 and 64x64 cursors. Currently, only black-and-white pixmaps can be used. Creates a cursor with the specified window system handle handle. Warning: Portable in principle, but if you use it you are probably about to do something non-portable. Be careful. Internal function that deinitializes the predefined cursors. This function is called from the QApplication destructor. Returns the window system cursor handle. Internal function that initializes the predefined cursors. This function is called from the QApplication constructor. Examples: chart/canvasview.cpp, fileiconview/qfileiconview.cpp, and menu/menu.cpp. 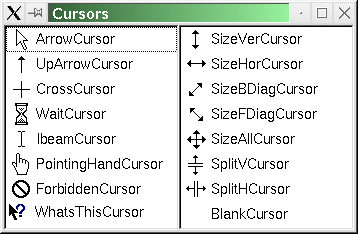 See CursorShape for the list of cursor shapes. Returns the cursor shape identifier. The return value is one of the CursorShape enum values (cast to an int). Writes the cursor c to the stream s.
Reads a cursor from the stream s and sets c to the read data.